"I admire your courage, Miss … ?" "Trench. Sylvia Trench. I admire your luck, Mr. …?" It was an exchange over a Baccarat table that introduced to the world Ian Fleming's indefatigable secret agent, as played by Sean Connery. 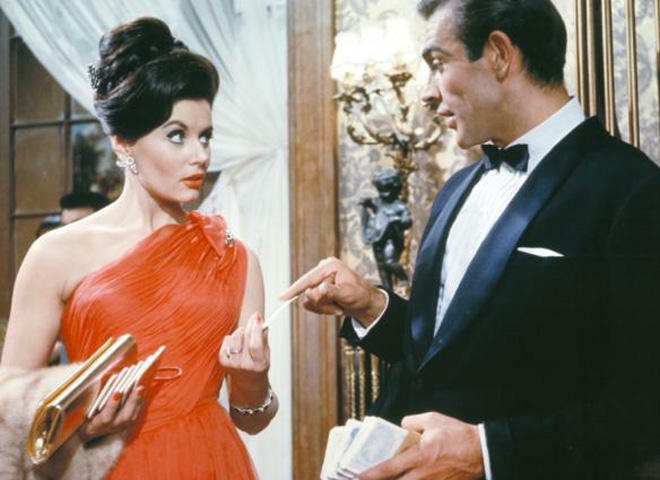 It also marked the first appearance of a "Bond Girl," actress Eunice Gayson. Unlike many Bond Girls who would meet untimely ends during the franchise's 50-year-plus history, Gayson's character Sylvia Trench actually appeared in two films – the very first 007 adventure, "Dr. No" (1962), and "From Russia With Love." "We are very sad to learn that our dear Eunice passed away on June 8th. An amazing lady who left a lasting impression on everyone she met. She will be very much missed." In a 2012 interview with the Daily Record, Gayson explained that she helped Connery overcome nerves on the very first day of production when he kept bumbling his now-iconic opening line. Taking him to lunch and pretending to imbibe herself, she encouraged him to go off the wagon and loosen up with a drink. He downed two. "Well, not having had a drink for so long, it really affected him, but in a nice sort of way – all his nerves seemed to go out the window," she said. "We went back on set and he said the name 'Bond, James Bond' in a beautiful way." As originally planned, the character of Trench was to have returned in subsequent Bond adventures, but director Guy Hamilton dropped her from the third film, "Goldfinger." Gayson held a notable place in film history as the very first Bond Girl, though it wasn't without its indignities. A striking presence, Gayson's voice was nevertheless dubbed over by another actress in both films. Born in 1928 in Surrey, England, Gayson made stage appearances in "Born Yesterday," "No, No Nanette," "The Sound of Music," and in British TV revues. Her first film appearance was in 1948's "My Brother Jonathan." Her credits include "To Have and To Hold," "Miss Robin Hood," the Goon comedy "Down Among the Z Men," "Dance Little Lady," the historical drama "Zarak," and two thrillers from director Terence Fisher: "The Last Man to Hang" and "The Revenge of Frankenstein." She also appeared on TV in "The Saint" (starring future Bond Roger Moore), "The Avengers," and "Secret Agent." In the 1990s she returned to the stage to play Little Red Riding Hood's grandmother in a London production of Stephen Sondheim's "Into the Woods." In 2012 Gayson wrote her autobiography, "The First Lady of Bond" (Signum).